One Fruity Oaty bar, keep the change! Next time we’re on Beaumonde, let’s hit the Maidenhead bar! I’m buying! 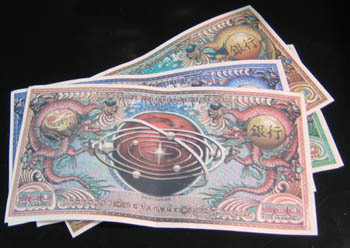 This is Firefly money, a reproduction of what was shown in Serenity. It was a very kind and unexpected gift from a Jayne hat recipient. He e-mailed me to say that the little Blue Sun stickers which I stick in with the hats – not advertised on the website, because I do like little surprises – were a big hit with him and the missus. He asked if he could purchase a few more from me. He seemed like a very nice guy, so I went ahead and mailed him some, no charge. And he sent that cash back to me! Please note, all blurriness is me not holding my camera steadily enough. This stuff looks fantastic. The paper has a great feel, and the graphics are very crisp. It lives right next to the spot I keep all incoming Jayne hat checks. Did I squeal like a gigantic fangirl when it arrived? You bet! 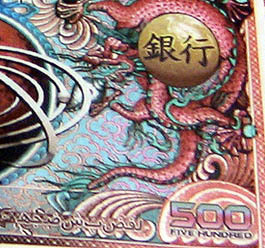 I only hope it’s not a felony to reproduce the money – I don’t need that kind of trouble with the Alliance. Thanks, , you made my day! Cars, knitting, kids, Dragonrealms, and Jayne hats. We’ve got it all! Look familiar? Can’t put a name to the face? Why, that’s Stephen Tobolowsky, of course! Forget James Brown, Stephen Toblowsky‘s the hardest working man in showbiz. And he’s got a new movie coming out that looks fantastic. Stephen Toblowsky’s Birthday Party. There’s a trailer up at apple.com, and it’s getting good reviews. The guy’s been in more movies than God, I definitely want to hear some of the stories he’s got to tell. I’m ordering my copy today, and if you want to be one of the cool kids, you should too. 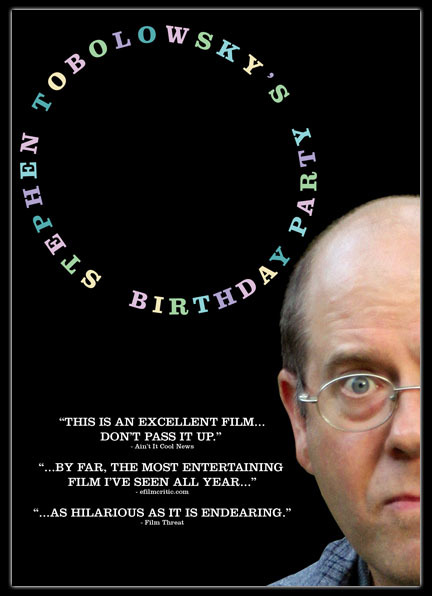 Remember that website, folks, it’s http://www.stbpmovie.com/ And after thirty freakin’ years in the biz, when Stephen Tobolowsky FINALLY gets the name recognition he so richly deserves… remember, you heard it here first! The car, she is back. The mechanic did not charge me for the fix, which was a cracked spark plug. However, it is STILL stuttering, particularly when the air conditioning is on and it is in drive, especially when accelerating from a stop or idling with my foot on the brake. Grr. My mother has offered a knitting-for-shoes trade, wherein she will supply the money so that I can buy a good pair of shoes and I will knit her something, probably a handbag. 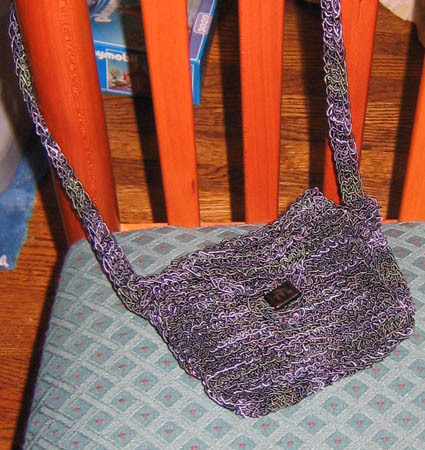 I made her this small purse in 2004, allegedly for her birthday which is in June, but it actually didn’t get delivered until Christmas. Note also lining sewn in inside-out. Linings are not my strong suit. 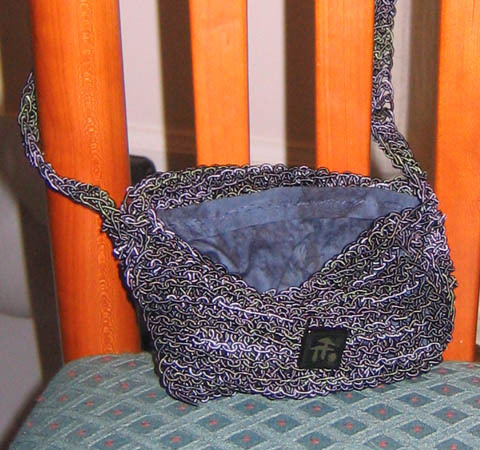 It also has the button pictured to the right, which I tried like heck to find out about, but I never really learned more – just that I really liked it and it seemed perfect for the bag. As with all gifts I make for people I love, I dithered over it for hours. Fortunately, the staff at The Sewing Bird knows me and is patient. The yarn is a little darker and more subtle than it looks here, so it’s more of a winter bag, and we’re into warmer weather now. I threatened to eBay the remaining Noro Daria, which was difficult on the needles, but still have it in my stash. It may have been a pain to work with, but it sure turned out pretty, and I’d use it again for the right person. Noro, I wish I could quit you! My mother has also graciously offered to watch our daughter tomorrow afternoon. The hubby and I get a day together! Yay! So we’re going to get lunch somewhere nice and go see X-Men 3. I haven’t heard the best reviews from our local critic, but who cares? It’s a grownup movie and we’ll be together. Life is good. Looking for info on something on my computer turned up logs of an old online D&D session with (Elf), (rogue), (cleric), (mage), and as the DM. Elf:	turns to look at the Rogue before letting an arrow loose. Dwarf (me):	holy crap. I’m glad I’m not in front of you. Cleric:	Did he just shoot himself? DM:	That’s a fumble threat. We need to see if you actually… yes, yes you do. Dwarf:	oh, that’s muuuuch better. DM:	The arrow goes whizzing up into the air, hits the ceiling, and then clunks down right in the middle of the kobolds. They all look down at it, look at each other, stand up, and grab their weapons. DM:	They see you now. Dwarf:	We are so toast. Elf:	Holds his head in his hand and slowly shakes his head. Man, I miss those sessions. I’d love to get another online game going. Good times, good times. …my car is back in the shop. Yes, ladies and gentlemen, three days after getting the car back for a second time, the check engine light came on again. And it’s still stuttering at stops. I don’t know if it’s a problem with the idle speed or a fuel mix issue – although my money’s on fuel mix – but I’d really like to have it fixed. I’ve spent more than 900 dollars on this puppy this month. Let’s get it right. Got a few DR things to do today – some paperwork, some behind the scenes stuff, and still needing to track down a few people for tattoos. The daughter’s hot water bottle cozy is almost done. 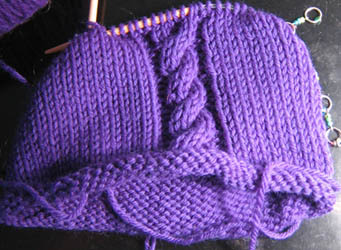 Blue scarf is about a third done, but on the back burner for the moment. Jayne hat on the needles for Australia, then North Carolina and New York. It’s out! It’s out! It’s out!! I don’t know why Amazon says it’s not available yet, when I own my very own copy, purchased from Heroes Aren’t Hard to Find here in town. In fact, I got the last copy – ‘Heroes’ sold out the first day and are having to re-order. My only regret? Linda Medley’s Castle Waiting website says that her online store is temporarily closed, because I want to buy the colorplates to paste into my copy. Pretty pretty hardbound with built-in ribbon bookmark. I only wish it were larger so that the art could be better appreciated. But at 448 pages and 1.9 pounds, there’s a lot of content here to enjoy! 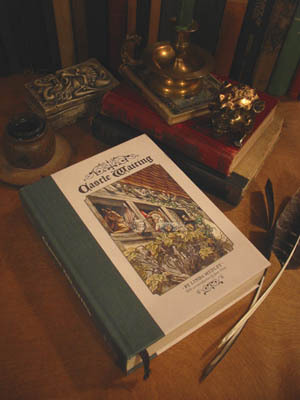 This would make a fantastic gift for someone who loves fairy tales, particularly for any young woman age 13 and up. I’m going to have to restrain myself from buying copies for everyone I know. There is a bit where the young woman who flees to the castle is running from her husband, and it’s implied that he hit her, but you never see it actually happen. In fact, you can see that bit in the sample chapter she’s got up on her site. I’m particularly excited that it contains new material that wasn’t originally released with the comic series. Linda Medley stopped one issue shy of wrapping up a storyline (the one about the abbey for bearded women), which thankfully is completed here. You know how big a deal Serenity was for Firefly fans, myself included? You know how people waited on line for the next Harry Potter book? This is every bit as big a deal for me, so I hope you will forgive my demented fangirl squealings. But this book is a beautiful, moving, family-friendly fairy tale. It manages to be clever, funny, and strong on faith, all without being cloying. If you’ve got a fantasy-loving gal in your life, consider this as a gift for her. If that fantasy lover is you, consider it as a gift for yourself. I’ve got a $16 credit at Amazon.com, and it’s on sale for about $18, down from the $30 list price. I just may buy another copy. Persimmon tree and water bottle cozy. Remember my posts about the persimmon tree being spared from death? Well, this happened today. On the knitting front, the new hot water bottle cover is going much better now that it’s not made from insanely thin sock yarn. I had nearly an entire skein of Cascade 220 in purple leftover after the eye-searing felted bag I did for my kid’s teacher. The pattern calls for 190 yards of worsted wool (in other words, a skein of Lamb’s Pride worsted) so this is a good match. 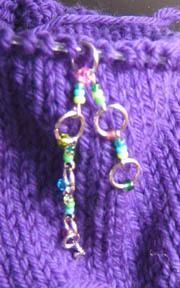 I want to point out that nifty stitch marker! In fact it’s a row counter made for me by as part of her Fiber Godmother swap. 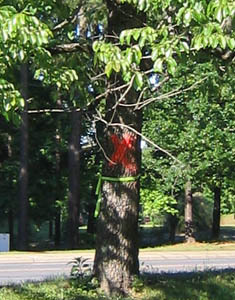 As you work each round, you move to the next loop on the marker to keep track of your rows. So for me, I make the first loop my cable, then move to the next loop on four subsequent rounds, then when I’ve only got one loop left on the counter I move it back to the beginning and do another cable row. Makes it very easy to remember what row I’m on without having extra gadgets to keep track of. Jayne-wise, hats up next for Glasgow, New York, and Berkshire, UK. And now, blueberry cornmeal muffins are cool, so I’m going to grab one! Yum! I could drink nothing but this all day and be happy. Unfortunately, white tea is expensive. Le sigh. Today, HSN (That’s Hot Starbucks Nerd to you) suggested for me a Valencia mocha. I took him up on it, and it was faboo. I drank about a third and the rest is in the fridge to be savored tomorrow. Tonight, chicken baked with a bottled garlic barbecue sauce, mashed potatoes, corn on the cob, and rolls. Summer in the South. Ahhhh. I’ve been walking more lately, and feeling better because of it. Tomorrow I’ll definitely be walking, as I’ll have to take my car into the shop and walk home from there. It’s having the same issues it was having before we spent 900+ dollars to fix it, except now they’re worse. Well, at least I’ll have that mocha waiting for me when I get back home. Non-food-related note: Margiemakes, I finally exchanged that shirt that was too small for the proper size, and some blue earrings you made for me for Secret Pal look perfect with it. Thank you! 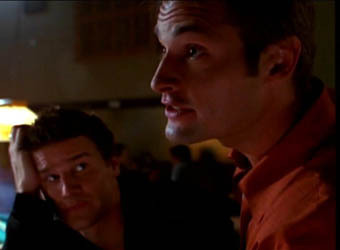 Is that Josh Holloway from LOST? Holy cats! 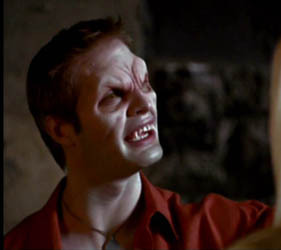 Sawyer’s a vampire! I always knew he was a bad boy, but man. This explains a lot. No wonder he’s hoarding all the sunscreen.